Have you been planning to remodel your kitchen by replacing the cabinets? If so, get ready to do some searching. Not only do you have to take looks and spacing into account, but you also have to consider the details of each cabinet, from wood type to the distance the cabinet will sit from the kitchen ceiling. Cabinets need to be functional, but space is only one part of the equation. When you start to look for new cabinets, think about how each component of the cabinet will combine with the others to create a fixture that is going to be one of the major visible features of your kitchen. If you’re used to the faux-veneer wood cabinets that you find in many apartments, you might not realize that there are several different species of wood available for use in custom cabinetry. These range from soft, knotty pine to harder oaks and ash. Pine is great for a rustic look, especially because it tends to show off a lot of darker knots. Those knots make the wood look fresh from the tree, even though it’s been dried and likely stained for use in the kitchen. However, it’s a softer wood and might not be good for homes where damage is likely to occur. Birch and maple are nice, light woods that are strong, and ash, oak and cherry are very hard woods that are better for those rough-and-tumble homes. They provide an elegant look that doesn’t dent easily. Note that many of these woods have pronounced grains; the more evident the grain, the more visually busy the wood will be. You’ve got a range of shades available via stain, or you could paint the wood. Painting is good if you want a definite uniform look to the wood; with the right number of coats, you’d hide the grain and the knots. That’s an advantage if you’ve chosen wood more for its durability than its looks, and you want to hide the grain. For wood that doesn’t have a visually prominent grain, you might want to stick with stains so you can see the actual wood. Lighter woods give kitchens an open, airy feel; darker colors often make the kitchen look cozier and a little more elegant. Door direction and type also impact how your kitchen looks. Swinging cabinet doors that open from right to left or vice versa are suitable for both traditional and modern looks. These are among the most common doors and are easy to get. Cabinet doors that you open by pulling down or raising up are better for kitchens where you want a streamlined, modern impression. Sliding cabinet doors are great for upper cabinets where there’s not a lot of clearance. Glass-fronted cabinet doors have two advantages. One is that they look lovely — the glass can be very ornamental. The other is that they allow you to see in, so you don’t ignore the items in that cabinet. If you’ve ever come home from a shopping trip with a new dish or pan, only to find you had the same style hidden in a cabinet, glass doors might be a great option for you. Of course, with glass doors, you can see into the cabinet, and so can everyone else. You’ll have to be very organized if you get glass doors. Last, don’t forget the interior color of the cabinet. For glass-fronted cabinets and many light woods, the interior color will likely be the same as the exterior color, especially if you use a smooth, light wood. 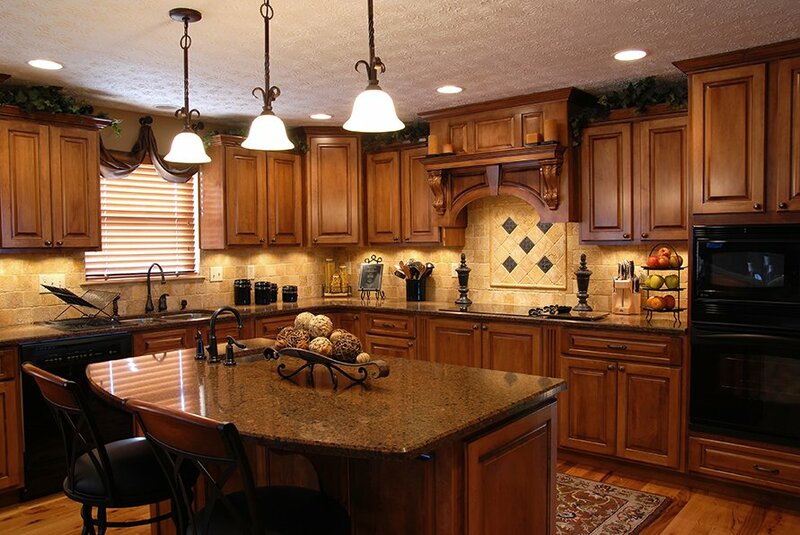 For darker cabinets with solid doors, you might look at having the interior painted or covered to match the back wall. Cabinets usually have open backs, so you can see the wall colors, and this can be jarring and look a bit cheap if you have dark cabinets and light walls. Plus, light interiors make the cabinets look more spacious inside. Work with a custom cabinet company like Huntsville American Cabinets to find the right cabinets for your kitchen. With more than 50 years of experience, you can trust that we can bring your custom cabinetry ideas to life, and our designs will be like no other!